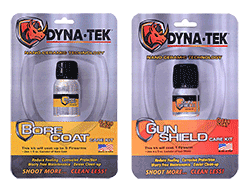 Looking for Dyna-Tek Bore Coat or Gun Shield? Dyna-Tek has returned to the Archery market! Dyna-Tek has entered into an exclusive agreement to supply our new DT-5000 DYNA-SLICKSHIELD™ clear coatings on the brand-new GOLD TIP® AIRSTRIKE™ carbon fiber arrow shaft. Dyna-Tek’s consumer applied SLICKSHIELD™ coating kits will not be available in 2019, but will return to the market at the 2020 ATA Show! Click here for more information on the GOLD TIP® Alliance. – More pulls per coat. – No sanding, dry-ice blasting between pulls. – Easy, hand-wipe re-apply DT-6060, cure and resume production. • Works with toughened epoxy resin systems, polyester, vinyl-esters, phenolics and BMI. • Excellent Adhesion to all metals including INVAR, composite substrates and other “finishes” such as plating. • Thermally stable up to 720⁰ F.